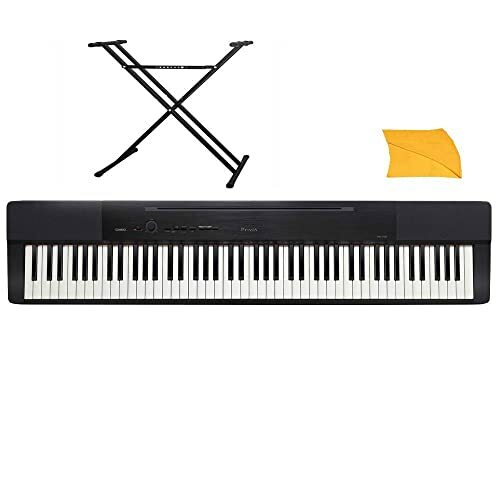 Casio Px150 Digital Piano Review - Is this keyboard any good? Today we are looking at the Casio PX150. This moderately priced portable keyboard should be a good fit for users that want to get as much quality as they can in an affordable package. Good buzzwords so far, right? Maybe so. Still, there are lots of factors that go into choosing the right keyboard. Even the beginner musician deserves an instrument suited to their playing style. 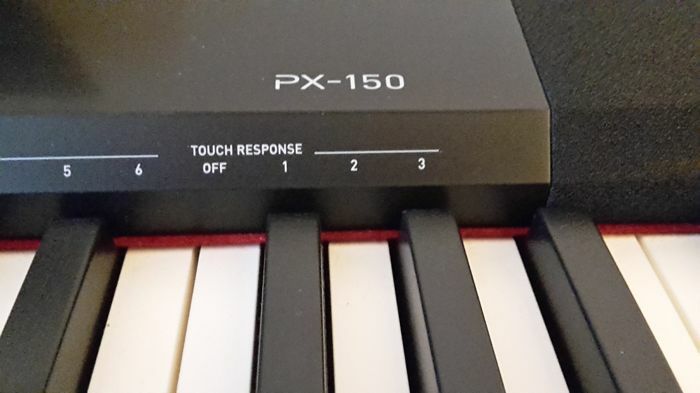 That in mind, a deeper look is required before a final decision about the PX150 keyboard. Fortunately, a deeper look is exactly what we are here to provide. Read on to find out if the Casio PX150 is right for you! 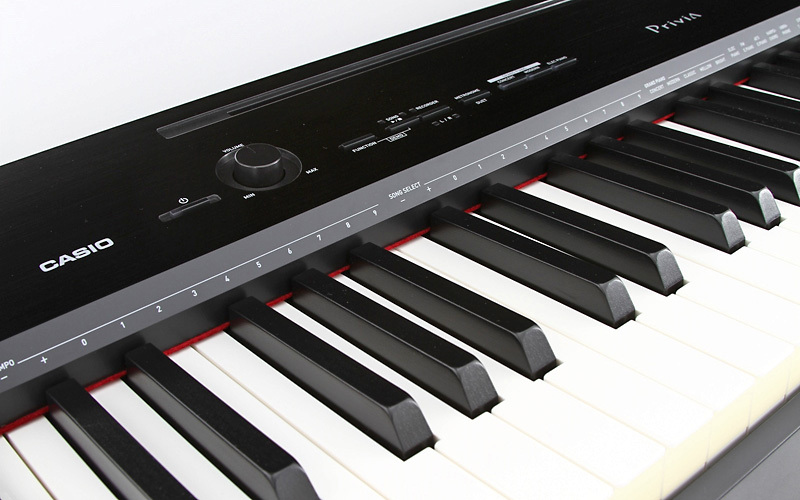 The keyboard interface is one of the most important components of any electric piano. After all, this is the part of the instrument that the musician actually interacts with. Ideally, it should feel as much like an acoustic piano as possible. To that end, the Casio PX150 is largely successful. While there are options out there that deliver a more nuanced replication of the classic acoustic feel, the PX150 still manages to check all the right boxes. 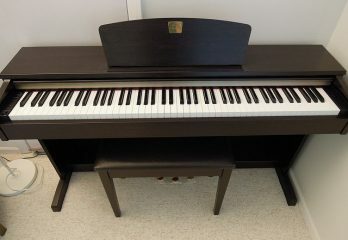 It features weighted keys, and a synthetic ivory covering that will replicate the feel of a traditional piano key. 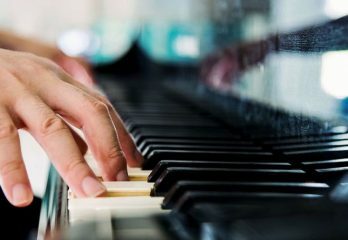 If you are new to the piano, this may sound like a small touch, but it is actually very impactful. Transitioning from acoustic to digital, or vice versa is often a challenge. Why? Because digital keyboards of the past have felt completely different from acoustic pianos. However, better technology creates better opportunities. As a result, it is pretty well expected for a digital keyboard to feel like an acoustic these days. The other thing to keep in mind is that this keyboard responds to your touch similarly to an acoustic. This is due mostly to the PX150’s tri-sensor. This sensor technology gives users the chance to add nuance to their performance. The tri-sensor is able to register how hard and fast you are playing and can respond appropriately. As a result, you should enjoy more or less the same range of playing options that acoustic users enjoy. You get two onboard speakers with this unit, which is pretty standard. 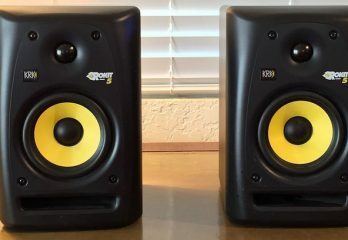 There are options out there with more, but for practicing at home, the two speakers should be sufficient. 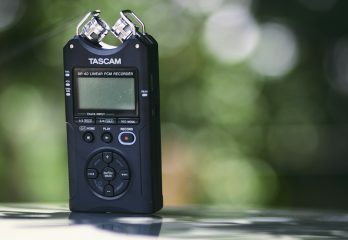 For traveling performances, you will, of course, need to consider the use of amplification systems. The Privia sound engine that you get here is truly impressive. The software has been expanded to enjoy three times more memory than previous iterations. This means that the sound engine has a more robust understanding of acoustic piano tones. As a result, the sounds that it produces rival the sound generated by traditional pianos. 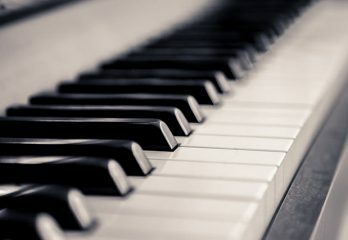 The keyboard allows you to apply nuance to your playing, while the revamped sound system allows you to really hear that nuance come to fruition. It even features damper resonance—a component of the keyboard that mimics the subtle effect of a hammer striking down on a piano string. The keyboard also features two headphone jacks for when you want to practice without waking up the entire house. No keyboard would be complete without some pre-programmed sounds and songs, right? Fortunately, the PX150 has plenty to offer in this department. 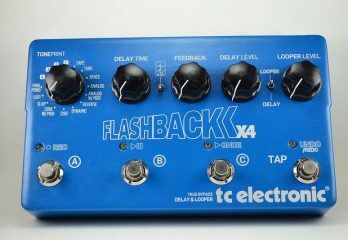 It features eighteen built in instrumental tones and sixty songs for practicing with. There are, admittedly, keyboards out there that have much more to offer in terms of pre-programmed tones. However, for the price, you really do get quite a lot here. Like most keyboards of this day and age, you can hook the PX150 up to your computer. 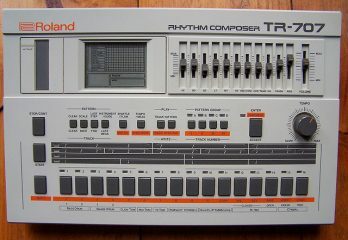 It features MIDI recording technology that is standard to most keyboards these days. The USB port is compatible with both Macs and PCs. 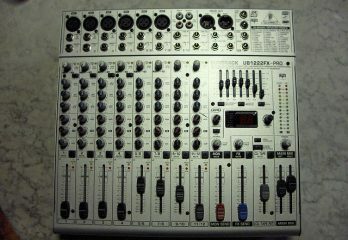 This technology makes it relatively easy to mix and record your own songs. There are keyboards out there that allow you to do this without the use of your computer. Obviously, there is a nice convenience factor to that. Still, hooking a keyboard up to a computer is not terribly inconvenient. For musicians on the go, portability is a key component of any keyboard. The PX150 is about easy to transport as it gets. The entire unit weighs only twenty-two pounds, and the stand folds up to be extremely compact. Granted, for some buyers, there is a downside to this. Many people want their electric pianos to have the appearance of an acoustic model. 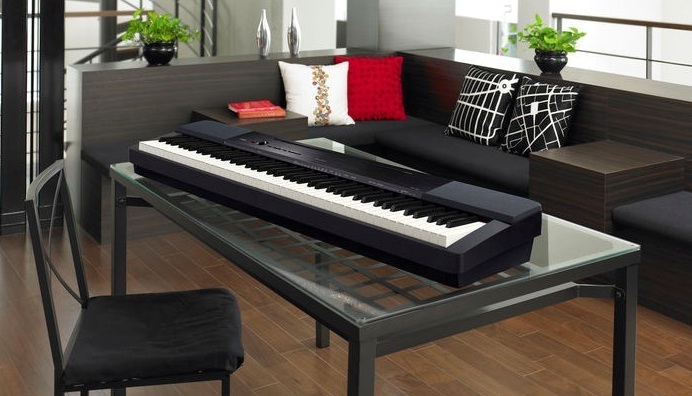 They value their keyboards as furniture pieces as well as instruments. The Casio PX150 was not built with décor in mind. Though not an eyesore by any stretch of the imagination, the entire design has been optimized with function in mind. For a product of its price range, there is little to say in way of cons. Understand, of course, that there are pianos out there that can do much more than the Casio PX150 is capable of. However, those more advanced features weren’t really what the company was setting out to accomplish here. 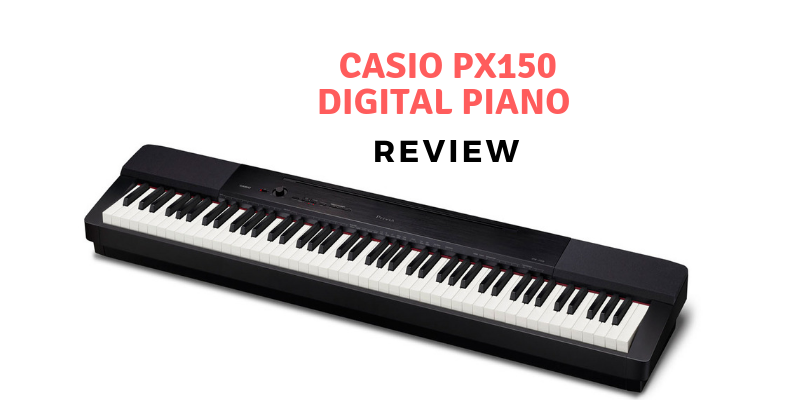 For a piano of its class, the Casio PX150 does most things right. The one concern that we did have was the feel of the keys. Earlier, we praised the quality of the keyboard’s responsiveness. Naturally, we do stand by that praise, but there is a tiny chink in the keyboard’s armor. Key weight. As we said, these keys are weighted to feel like the keys of an acoustic piano. While this is a feature that is an important element of any good keyboard, it can be overdone. That seems to be what has happened here. The keys are a little bit too heavy. This may or may not be better than being too light, but since the goal is to feel like an acoustic keyboard, it is certainly still a con. That aside, the piano is largely successful in what it sets out to do. It is a good keyboard available at a good price. Clearly, this keyboard is not without flaw. However, the issues that we found are mostly pretty moderate. The sad truth is that every keyboard in this price range is going to have drawbacks. If you want uncompromising quality, you have to be willing to increase your budget. Still, your money does buy you lots of good features here. It’s portable, it features a high-quality keyboard interface, and the sound is truly nuanced. At the end of the day, only you can decide if the Casio is a good fit. Still, for the price, it is an option that will be hard to beat.